You're in the final stages of the admission process, so take a deep breath and let us walk you through the remaining steps. Congratulations on your acceptance to the Mary Pappert School of Music! You've applied to Duquesne University and auditioned for the Mary Pappert School of Music. You've received your official letter of acceptance and undergraduate financial aid package. Enhancement Scholarships - In addition to the Lead with Music Scholarship (50% tuition coverage), these awards are issued to undergraduate applicants beginning March 21 and extending through April 10. Awards are issued based on a full review of each applicant's Audition Results (faculty feedback and recommendation), Academic Merit (Letters of Recommendation, GPA, SAT/ACT scores), and Financial Need (as determined by the FAFSA). Enrollment Deposit - Accepted students secure their scholarships as well as a spot in the incoming class by paying the enrollment deposit by May 1. The deposit can be paid online at duq.edu/pay-my-deposit. You will be asked to provide your Duquesne ID, an 8-digit code preceded by the letter "D", which can be found on your official acceptance letter. Freshmen Summer Advisement Transition (F.A.S.T.) - Each year in mid-July all incoming freshmen at Duquesne are invited to come to campus for this event. F.A.S.T. gives new students the opportunity to register for classes, get their Duquesne ID and set up a meal plan, as well as a chance to hang out with your future classmates while playing games and enjoying good food! This event will be announced and invitations issued late Spring. Move in and Orientation - Each year more than 6,000 student move into campus dormitories in a period of 3 days. Freshmen have earlier move-in dates due to freshman orientation. You will receive specific communication from Duquesne University's Office of Residence Life about when to arrive on campus for move-in. Every year, the Mary Pappert School of Music invites all recently accepted music students back to campus for a celebration. 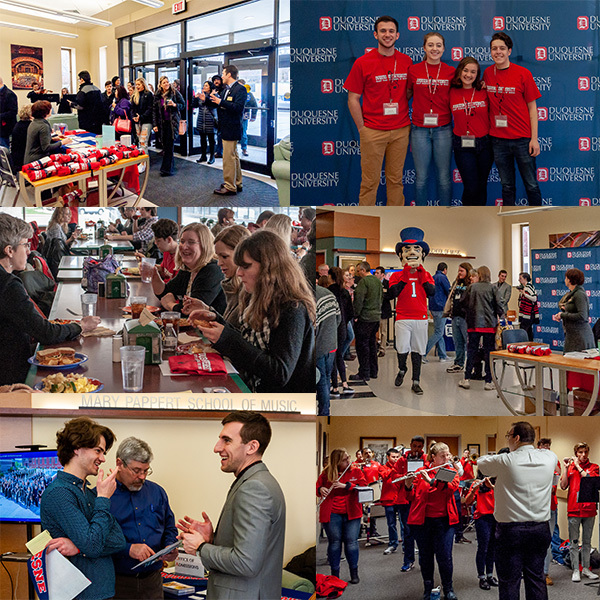 Showcase Saturday is your opportunity to come back and experience life at Duquesne through a new set of lenses, as an accepted student! Socialize with current students as well as faculty and staff members and attend degree-specific information sessions where you can hear directly from current students about their experiences. Enjoy live music, games, raffles, prizes and giveaways at our student service expo. Plus, we'll treat you and your family to lunch at Hogan Hall, home of the best food on campus! This year's showcase is March 30, 2019. All accepted students receive in invitation to RSVP for this event. If you have not received an invitation, please contact us directly to register for the event at musicadmissions@duq.edu. Congratulations on your acceptance to the Graduate Division of the Mary Pappert School of Music! You've received your official letter of acceptance. You've completed your FAFSA form (US citizen's only - recommended date of completion is February 15). You've completed your Graduate Assistantship Survey (recommended date of completion, no later than March 8). Graduate Awards - These awards are issued to undergraduate applicants beginning March 21 and extending through April 1. Awards are issued based on a full review of each applicant's Audition Results (faculty feedback and recommendation), Academic Merit (Letters of Recommendation, Resume/CV, Transcripts), and Financial Need (as determined by the FAFSA). All accepted graduate students receive an email with an attached document outlining the Graduate Assistantship program. This document contains an invitation link to complete the Graduate Assistantship Survey which is your opportunity to express interest in specific assistantship positions within the school. Enrollment Deposit - Accepted graduate students secure their assistantships and awards as well as a spot in the incoming class by paying the enrollment deposit by April 15. The deposit can be paid online at duq.edu/graddeposit. You will be asked to provide your Duquesne ID, an 8-digit code preceded by the letter "D", which can be found on your official acceptance letter. Graduate Orientation - Every graduate student is required to attend orientation August 22-23, 2019. The first day of classes begins the following Monday, August 26. Questions about the next steps? If you have any questions regarding the information above, please contact us directly at musicadmissions@duq.edu or call (412) 396-5064.